How to replicate an “aged tapestry” fill effect? I take the point that my needs are vast, because svg is working in crisp vector space and yet I want an aged tapestry fill like the inspiration. To keep things realistic, I am not looking to replicate at the pixel level, as Joonas pointed out, the SVG would be too complicated. But I still can't help but wonder, is there a way to achieve a convincing aged fill without coming across as overtly modern in terms of aesthetics? I'm trying to find a happy medium between the inspiration and my pure gradient; hopefully this kind of compromise would be palatable to the SVG format. Your version is quite a clean gradient. Add some irregularity. Put on it another shape which has a non-repeating noisy pattern. Use a blending mode, for ex. Hard light to cause modulation and reduce the opacity to keep the effect subtle. On top the grey pattern is my irregular shape. 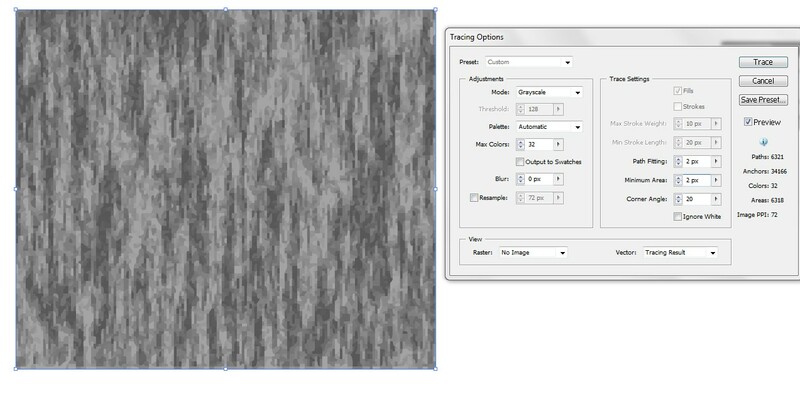 It's solid grey with noise effect in Inkscape. 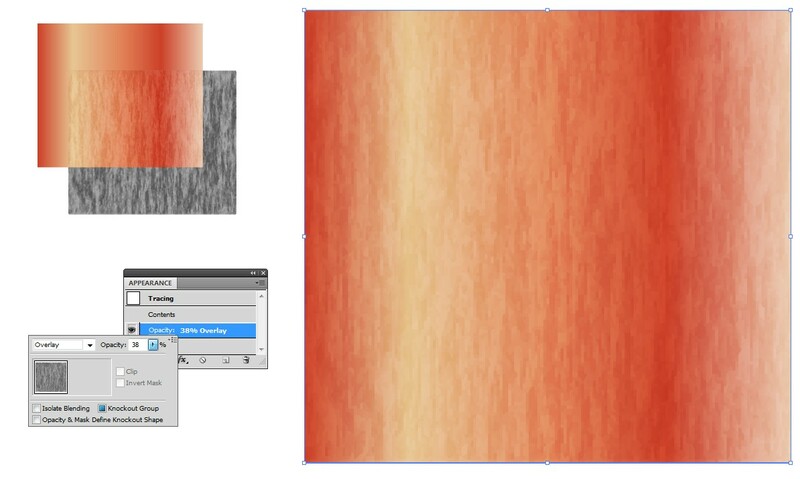 The lower image is the same pattern placed on a gradient (not as complex as yours) with reduced opacity. The blending mode is hard light. Subtle effect works as well with normal blending. Trying this in Illustrator needs an imported pattern, because there's no easy way to generate a random pattern except by drawing it or by having some lucky accidents. 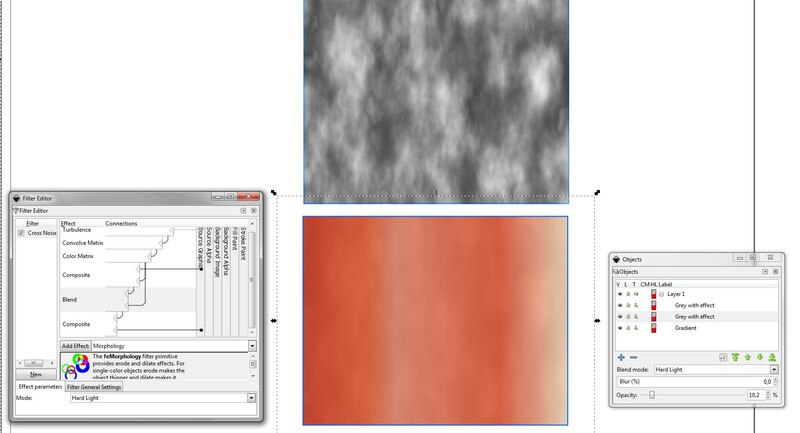 Illustrator users often have also Photoshop, which have plenty of tools to generate random looking patterns and you can always take a texture photo which you edit to the wanted shape in PS. 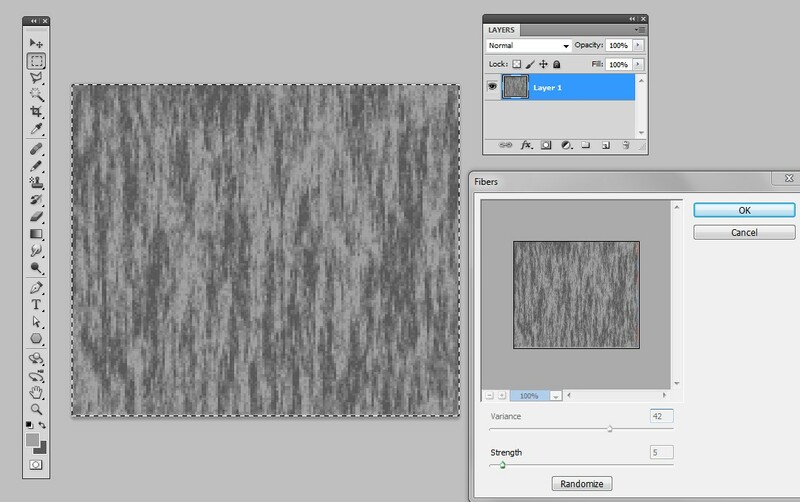 Here PS filter Render > Fibers is used to generate a pattern. The used colors are dark and light greys. The image has only about 200px width and height. Low resolution is handled fast later in Illustrator. The blending mode is overlay and the opacity is reduced for subtle effect. Check all available blending modes with different opacities because they all work differently! Disclaimer: this is not a direct answer, more of a workaround. To me, there are two ways to make something look aged. One is through a specific texture with dirty, smudged, falling apart, torn or sun-faded qualities. This would be a lot of work to do in vector graphics (but is probably what you are primarily looking for). The other one, that is presumably much easier is through shapes. Victorian tapestry or wallpaper from the 50's would have used some specific motifs that we now consider outdated, which will hopefully convey the "old" feeling. Combine with bleak, desaturated colors for extra aged effect. If you have the time, you can build some marks of erosion and passage of time into the pattern – brownish spots or tears – but be carful with those, as these will be repeated everywhere, leading to overuse over larger shapes. See e.g. here on how to create a custom pattern. Not the answer you're looking for? Browse other questions tagged adobe-illustrator svg fill or ask your own question. How to fill in areas surrounded by line segments? How to replicate this text effect? Skew? Arch? Bulge? Adobe Illustrator: How to fill in colors between lines? How to replicate this texture effect? How to replicate this photocopier distortion effect? How can I fill a contour?